Parents across England and Wales have been collectively fined up to £24 million for failing to send their children to school over the past three years, it's been revealed. An investigation carried out by the BBC found that some councils are issuing penalties that are five times higher than average. These "stricter" councils have insisted it is in the best interest of children. On average, 12 in 1000 children were taken out of school - with parents fined - either for truancy or for taking time off for holidays during term time, between 2016 and 2017. The Isle of Wight is among the councils charging a higher penalty, as well as Suffolk and East Riding of Yorkshire. These areas had a rate of more than 60 in 1000 pupils guilty of truancy. Paul Brading, Isle of Wight's cabinet member for schools, said its high rate of fines was because officials want every unauthorised absence to be "thoroughly followed through". From the beginning of the 2019 school year, summer holidays are being cut from six to five weeks, but an extra week will be added on to the October half term instead. Families continue to choose term-time due to the highly inflated prices of trips during school holiday time. Dave Brain, who wanted to take his family on a trip to Florida with money he was left by his father, chose to face the £60 fine and book during term time. He paid £4,500 for the trans-Atlantic trip - but would have paid in excess of £8,000 had they gone during the summer holidays. Mr Brain said, "We try and stick to the holidays, but this was different, and we budgeted for the fine. I would do it again in an instant if the opportunity arose." Generally, fines begin at £60 and rise to £120 if not paid within three weeks. Local authorities work alongside school in issuing these fines. A spokesman for the Association of School and College Leaders said: "There should be no need to issue any penalty notices, because children should not be removed from school without authorisation." 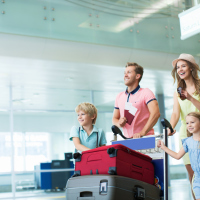 Get your family travel insurance sorted before your big trip. We offer a range of packages to suit every sort of family.